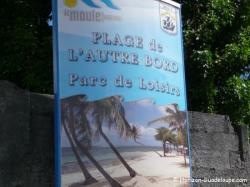 The beach "de l'autre bord" in "Le Moule" is a magnificent beach, strewed with coconut palms. It is one of rare beaches) of Guadeloupe (the only one?) watched by swimming coaches (mirador on the beach). Along this beach a hotel complex. Carbets to picnic and parking.